It’s not very often that you get completely blindsided by a game, and it turns into something you don’t expect – but when it happens, it makes for a memorable gaming experience. One such event happened last night when we played a game of the 2nd Edition of Mansions of Madness from Fantasy Flight Games. 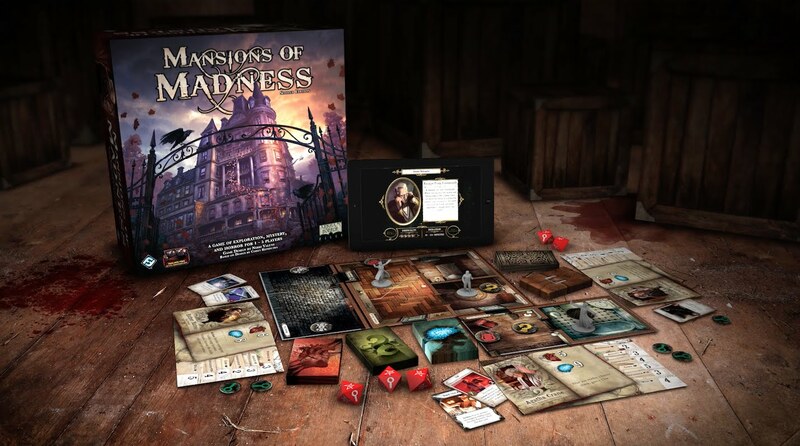 Just in case you are not aware, Mansions of Madness is a boardgame based in H. P. Lovecraft’s Call of Cthuhlu genre. It’s a miniatures boardgame in the ‘dungeon bash’ style, where players have character models that they move through a map, made up from a series of tiles. During a scenario, players explore the map, looking for clues, solving puzzles and perhaps encountering nightmarish monsters. Whilst the first edition of the game required one player to effectively be the games master and run the adventure, the second edition introduced an app to take over this role, which means that all players take the role of investigators. We’ve played the game before, so we thought that we knew what to expect – explore a location, get clues and items and at some point run into gribbly monsters that we would have to fight – you know, typical Lovecraft. Whilst I don’t want to give away any plot spoilers, this adventure caught us completely by surprise. Rather than the usual monster hunt we seemed to be thrown right into the middle of an Agatha Christie novel, although we didn’t quite realise it at the time. Because the game is managed by an application, and we had never played the scenario before, we found ourselves in the position that no-one had a clue what was going on – a situation that is subtly different from most of these types of games, because at least one person (the games master) has an idea – or at least you hope they do! The resulting game was one of the best playing experiences I’ve had this year as we progressed through the scenario with ever increasing tension as we tried to figure out what on earth was going on, and why weren’t things happening as we were expecting – a completely immersive and thoroughly enjoyable gaming session ensued. Whilst I admit that interacting with the app can be a little ‘clunky’ at times, the benefit it gives in this type of gameplay far outweighes any user interface issues. I would highly recommend that you give Mansions of Madness 2nd Edition as try. It provides a different but very satisfying gaming experience, and as we found last night, it is not beyond throwing players several complete surprises. The Vengful Impules scenario is part of the Beyond the Threshold expansion for the game. I was wondering about that. Funnily enough, in the screen shot for the scenario we played, there was a character that we didn’t meet in our game. Indeed, sgw74 and I have played a lot of MoM together and the game has no end of novelty. It’s part of the charm that failed adventures are a learning experience for the next time around; however, while previous plays will help you along the Mansion always has a new twist to make sure you’re not taking anything for granted. And the minis are full of character and paint up really well.